Coraline Jones (voice: Dakota Fanning), a girl of eleven or so, moves with her parents (voices: Teri Hatcher and John Hodgman) into an apartment in a dilapidated pink Victorian house. On a walk with a dousing rod, Coraline meets Wybie Lovat (voice: Robert Bailey Jr.), whose grandmother grew up in the house, and a cat (voice: Keith David) that Wybie says is feral. They find an old well on the hill above the house. Wybie is a little surprised that his grandmother agreed to rent to the Joneses; usually she tries to find tenants without children. Later, Coraline's mother gives her an old ragdoll that Wybie brought over - the doll from the beginning of the movie. A note says that he found at his grandmother's in an old chest. The button-eyed doll looks strikingly like Coraline. He tells Coraline that his grandmother had a sister who disappeared as a child, and that he's never been inside the house. Coraline is lonely, having moved away from her friends, and her parents don't pay much attention to her because they're busy writing a garden catalog. In the living room she finds a small door that's been wallpapered over. She nags her mother to open it, but there's only a brick wall on the other side. The mother speculates that it was closed off when the old house was divided into apartments. That night, Coraline awakes and follows a mouse through the small door, which now opens on a mysterious tunnel. At the other end of the tunnel is another living room in another house that looks just like Coraline's. It's inhabited by people who look just like Coraline's parents, except that they have buttons where their eyes should be -- like the doll Wybie gave her. 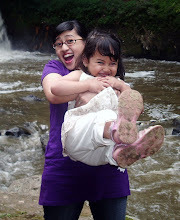 Other Mother and Other Father are kinder and more attentive than her real parents, and Coraline is delighted with them. They eat a good meal, and she returns to bed -- but when she wakes up, she's back in her real life. Coraline visits the tenants of the other apartments in the house: upstairs, Mr. Bobinsky (voice: Ian McShane), who is trying to develop a circus of trained mice; and downstairs, Miss Miriam Forcible (voice: Dawn French) and Miss April Spink (voice: Jennifer Saunders), a pair of retired actresses who live with their Scottie dogs. As she leaves the actresses she runs into Wybie who reveals that he's never been in the Pink Palace because his grandmother fears he will suffer the same fate as her twin sister-who was 'stolen'. That night, she leaves some cheese, hoping that the mice will return and direct her through the door. They do, and in the Other world, she meets a button-eyed version of Wybie who can't speak. She and Wybie are delighted by a show put on by the Other Mr. Bobinsky and his dancing mice. She goes back to her world and when her mother refuses to buy her some gloves, Coraline becomes upset and goes back through the tunnel. She discovers that Wybie's cat can move between the worlds, but in the Other world, it can speak. It warns Coraline about the Other Mother. The Other Miss Miriam and Other Miss Spink put on a show for a delighted Coraline. The Other Mother asks Coraline to come and live permanently in the other world. At first Coraline is interested. But to stay, Coraline must allow the Other Mother to replace her eyes with buttons. Frightened and appalled, Coraline turns down the offer and runs to bed, hoping to wake up in the real world. However, when she wakes up, she's still in the Other world. She tries to escape through the little door, but the door to the room where it is located is locked. Accompanied by the cat, Coraline walks away from the pink house, but she doesn't get far before the other world begins to lose detail, and soon the landscape is entirely blank. They keep walking until they come back to the house, and Coraline breaks into the room with the door. A giant beetle is guarding the little door to the real world and the Other Mother tries again to persuade Coraline to stay with her. Coraline refuses and demands to be allowed to go home. The Other Mother, becoming angry, grows grotesquely tall and elongated. (Eventually she is shown to be a spider.) She punishes Coraline by dragging her from the room by the nose and tossing her through a magic mirror, where she's trapped. Behind the mirror, Coraline meets the ghosts of three children (voices: Aankha Neal, George Selick, and Hannah Kaiser) who the Other Mother lured into her world long ago. They can't leave because the Other Mother has hidden their eyes (souls) -- but if Coraline can find their eyes, the ghosts can be released. The ghost children call the Other Mother the beldam. (Beldam means ugly old woman, but it has connotations of witchcraft and recalls characters from literature and folklore: the title character of John Keats's poem "La Belle Dame Sans Merci" (http://www.bartleby.com/106/193.html), in which a knight is enthralled by a fairy; and the witch who entices and captures Hansel and Gretel.) 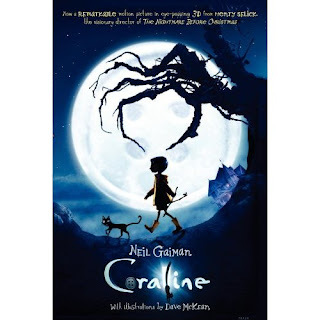 Coraline realizes that one of the ghosts must be Wybie's grandmother's lost sister. We realize that the doll from the opening credits was also Wybie's grandmother's lost sister. The Other Wybie frees Coraline from the mirror. She returns through the little door to the real world to find her parents missing. They seem to have been gone for some time; the groceries her mother went out to buy before Coraline last saw her are rotting in the kitchen, still in their bag. Wybie comes to the door and apologetically asks Coraline to return his grandmother's doll. She tries to tell him about her predicament, but he thinks she's nuts and she gets mad at him. She visits Miriam and April to ask for help, but all they have to offer is a tea-leaf reading ("terrible danger! "), some really old candy, and a triangular green seeing stone with an opening in the middle. The next morning, Coraline sees her parents in the hall mirror; they need help. Coraline realizes she has to go back to the Other world. In the Other living room, she hears her parents' voices, sounding small and far away, but she can't tell where they are. Having been advised by the cat that the Other Mother likes games, Coraline proposes a challenge. She will look for her parents and the ghost childrens' eyes. If she finds them, the Other Mother will let them all go. If she doesn't find them, Coraline will stay with the Other Mother and exchange her eyes for buttons. Coraline uses the seeing stone to find the three eyes. The first is in the garden (the shift knob on the praying mantis tractor); the Other Father helps her get it but is destroyed while doing so. The second is in Miriam and April's apartment (appearing as a pearl ring). The third is at Mr. Bobinsky's (a ball that the mice use in their show). A rat almost gets away with it, but the cat catches the rat. Back in the other living room, one of the ghost children warns Coraline that the beldam won't let her go even if she wins. Coraline tricks the Other Mother into unlocking the little door. As she is doing this, the cat realizes that the parents are trapped in the snow globe on the mantle. Coraline throws the cat at the Other Mother to distract her, grabs the snowglobe and the key as she runs for the little door. The Other Mother turns the room into a giant spider web, and catches her in it. Coraline manages to get to the door, and slams it (with the help of the ghost children) on the Other Mother's wrist, with the hand falling off into the tunnel. Back in the real world, the snow globe on the mantlepiece is broken and dripping. Coraline's real parents walk into the house, the snow on their clothes disappearing so fast that it's gone before Coraline can point it out. They have no memory of being imprisoned in the snow globe. That night Coraline puts the eyes of the ghost children under her pillow and dreams of them. The ghosts are happy to be free, but they tell her that the Other Mother is trying to get back the key to the little door. Sure enough, the Other Mother's severed hand crawls out of the tunnel and comes looking for the key, which Coraline is wearing around her neck. Coraline goes outside and makes her way to the old well, stalked by the hand. The hand attacks her before she can throw the key in the well. Wybie comes to her rescue, but is almost lost down the well before Coraline can rescue him in return. In the end Wybie crushes the hand with a rock. They wrap the hand and the rock in a blanket, tie it up with the string from the key, and throw them down the well. Some time later, there's a party in the garden. Coraline's parents have actually planted something for once: scores of red tulips, which are beautifully in bloom. Everyone is there; Coraline finally meets Wybie's grandmother, and promises to tell her a wonderful story.